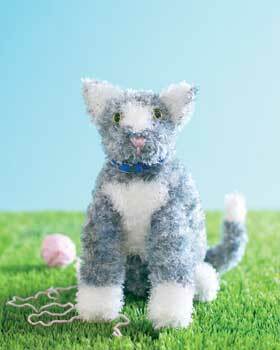 Knit a cute kitten stuffed animal for any child to snuggle. This toy knitting pattern from Bernat Yarns is intended for intermediate knitters. Knitting Needles: Size 5 mm (U.S. 8) knitting needles or size needed to obtain gauge. 2 yds [1.9 m] of smooth pale pink yarn for nose. Measurements: Approx 11 ins [28 cm] tall. Gauge: 16 sts and 30 rows = 4 ins [10 cm] in stocking st.
Psso = Pass slipped stitch over next stitch. P2sso = Pass 2 slipped stitches together over next stitch. Sl2togK = Slip next 2 stitches tog knitwise. Note: When working in Color Block technique, wind small balls of the colors to be used, one for each separate area of color in the design. Start new colors at appropriate points. To change colors, twist the two colors around each other where they meet on WS to avoid a hole. With MC, cast on 8 sts. 3rd row: Inc 1 st in each st to end of row. 16 sts. 5th row: Inc 1 st in first st. K1. *Inc 1 st in next st. K1. Rep from * to end of row. 24 sts. 7th row: K1. Inc 1 st in next st. *K2. Inc 1 st in next st. Rep from * to last st. K1. 32 sts. 11th row: K1. Inc 1 st in next st. *K3. Inc 1 st in next st. Rep from * to last 2 sts. K2. 40 sts. 15th row: K2. Inc 1 st in next st. *K4. Inc 1 st in next st. Rep from * to last 2 sts. K2. 48 sts. 19th row: K2. Inc 1 st in next st. *K5. Inc 1 st in next st. Rep from * to last 3 sts. K3. 56 sts. 23rd row: K3. Inc 1 st in next st. *K6. Inc 1 st in next st. Rep from * to last 3 sts. K3. 64 sts. Work 13 rows even. Break MC. Shape upper body: 1st row: With A, K8. With MC, K48. With A, K8. 2nd and alt rows: Purl, having first and last 8 sts in A. 3rd row:With A, K8. With MC, K10. K2tog. K8. K2tog. K4. K2tog. K8. K2tog. K10. With A, K8. 60 sts. 5th row:With A, K8. With MC, K10. K2tog. K6. K2tog. K4. K2tog. K6. K2tog. K10. With A, K8. 56 sts. 7th row:With A, K8. With MC, K10. (K2tog. K4) 3 times. K2tog. K10. With A, K8. 52 sts. Work 3 rows even, having first and last 8 sts in A. 11th row: With A, K8. With MC, K10. K2tog. K2. K2tog. K4. K2tog. K2. K2tog. K10. With A, K8. 48 sts. 15th row: With A, K8. With MC, K10. (K2tog) twice. K4. (K2tog) twice. K10. With A, K8. 44 sts. 19th row: With A, K5. K2tog. K1. With MC, K3. K2tog. K18. K2tog. K3. With A, K1. K2tog. K5. 40 sts. Work 3 rows even, having first and last 7 sts in A. 23rd row: With A, K5. K2tog. With MC, K2. K2tog. K18. K2tog. K2. With A, K2tog. K5. 36 sts. Work 3 rows even, having first and last 6 sts in A. 27th row: With A, K6. With MC, (K2tog) twice. K16. (K2tog) twice. With A, K6. 32 sts. 28th row: With A, P6. With MC, P26. Break A. Shape right side of neck: Next row: (RS). With MC, K12. Turn. Leave rem sts on a spare needle. Working on these 12 sts only, cast off 2 sts beg next and following alt row. 8 sts. Cast off 4 sts beg next and following alt row. With RS of work facing, join MC to rem sts and cast off next 8 sts for center back. Knit to end of row for Left Side of neck. 12 sts. Cast off 2 sts beg next and following alt row. 8 sts. Beg at neck edge, sew center front seam of Body. Weave yarn through cast on sts and draw up tightly. Fasten securely. Stuff Body through neck opening. With MC, cast on 32 sts. 1st row: (RS). Inc 1 st in first st. K11. K2tog. K4. K2tog. K10. Inc 1 st in next st. K1. 32 sts. 3rd row: Cast on 2 sts. K15. K2tog. K2. K2tog. K13. 32 sts. 4th row: Cast on 2 sts. Purl to end of row. 34 sts. 5th row: Inc 1 st in first st. Knit to last 2 sts. Inc 1 st in next st. K1. 36 sts. 7th row: K4. Inc 1 st in each of next 3 sts. Knit to last 7 sts. Inc 1 st in each of next 3 sts. K4. 42 sts. 11th row: K4. (K2tog) 3 times. Knit to last 10 sts. (K2tog) 3 times. K4. 36 sts. Shape right side of face: Next row: Cast off 5 sts. K9 (including st on needle after cast off ). Turn. Leave rem sts on a spare needle. Working on these 9 sts only, dec 1 st at each end of needle on next and every following alt row to 3 sts. Shape gusset: Rejoin MC to next 8 sts from spare needle. Inc 1 st in first st. K5. Inc 1 st in next st. K1. 10 sts. Next row: K2tog. K6. K2tog. 8 sts. Purl 1 row. Break MC. With A, work 2 rows even. Next row: K2tog. K4. K2tog. 6 sts. Next row: K2tog. K2. K2tog. 4 sts. Next row: (K2tog) twice. 2 sts. Shape left side of face: Rejoin MC to rem 14 sts from spare needle and knit to end of row. Next row: (WS). Cast off 5 sts. Purl to end of row. 9 sts. Dec 1 st at each end of needle on next and every following alt row to 3 sts. Using flat seam and beg at neck edge, sew center front seam of Head to cast off sts of face shaping. Sew side edges of gusset to side edges of face, having point of gusset at center front seam of Head. (See Diagram I). Following manufacturer’s instructions, apply eyes to Head as shown in picture. With smooth pink yarn, embroider nose and mouth. (See Diagram II). Stuff Head. Sew Head to Body, aligning center front seams. With MC, cast on 9 sts. Proceed in stocking st for 4 rows. Next row: (RS). K2tog. Knit to last 2 sts. Sl1. K1. psso. 7 sts. Rep last 4 rows once more. 5 sts. Next row: K2tog. K1. Sl1. K1. psso. 3 sts. Next row: Sl2togK. K1. p2sso. With A, cast on 7 sts. Next row: (RS). K2tog. Knit to last 2 sts. Sl1. K1. psso. Next row: Sl2togK. K1. p2sso. Fasten off. With WS tog, sew Ear Lining to Outer Ear using flat seam and stretching Ear Lining slightly to fit. (Ear will curl in slightly). Position Ears on Head as shown in picture and sew in place. With A, cast on 14 sts. Proceed in stocking st for 2 rows. Next row: (RS). K5. Inc 1 st in each of next 4 sts. K5. 18 sts. Next row: K5. (K2tog) 4 times. K5. 14 sts. Work 7 rows even. Break A. With MC, cont in stocking st until work from beg measures 4½ ins [11.5 cm], ending with RS facing for next row. Cast off 5 sts beg next 2 rows, then cast off rem 4 sts. Fold Front Legs in half lengthwise. Sew side edges and cast on edge. Stuff Front Legs. With A, cast on 6 sts. 1st row: (RS). Inc 1 st in each st to end of row. 12 sts. Cont even in stocking st until work from beg measures 2 ins [5 cm], ending with RS facing for next row. Break A. With MC, cont in stocking st until work from beg measures 3½ ins [9 cm], ending with RS facing for next row. Next row: *K2tog. Rep from * to end of row. 6 sts. Break yarn, leaving a long end. Thread yarn through rem sts and draw up tightly. Fasten securely. Sew side edges together. Stuff Legs. Weave yarn through cast on sts and draw up tightly. Fasten securely. Sew Back Legs to Base of Body, making sure Kitten sits properly. Position top of Front Legs against Kitten’s chest so that paws face forward and Kitten sits up as shown in picture. Sew Front Legs in place. With MC, cast on 12 sts. Proceed in stocking st until work from beg measures 6 ins [15 cm], ending with RS facing for next row. Next row: *K2. K2tog. Rep from * to end of row. 9 sts. Cont in stocking st until work from beg measures 8 ins [20.5 cm], ending with RS facing for next row. Next row: *K1. K2tog. Rep from * to end of row. 6 sts. Break MC. With A, cont in stocking st for 9 rows. Break A, leaving a long end. Thread end through rem sts and draw up tightly. Fasten securely. Sew side edges together using flat seam and stuff Tail lightly as you sew, AT SAME TIME, insert pipe cleaner into Tail behind seam as you stuff tail. Sew Tail in position. Buckle Cat Collar around neck. Instead of buying a gazillion "how to" books, I find everything I'm looking for here! From felting to baby clothes to painted pots. Thank you!